At last, after over 30 years of paddling either in semi-blindness or struggling with Croakies, string or duct tape I discovered Seaspecs, Prescription Sunglasses that stay on! You can dive into the river, stand under a waterfall or paddle the river. They also do CLEAR lenses for kayaking in North Wales in the winter! 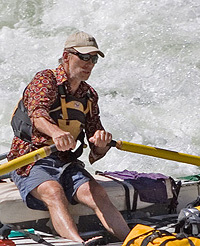 National Champion in slalom canoeing, a pioneer in the sport of canoeing and author.